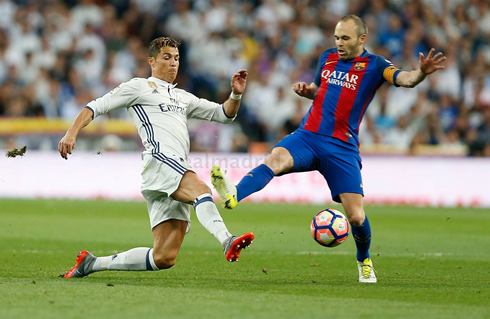 The first El Clasico of 2017 ended with a Barcelona victory, as the Blaugrana visited the Santiago Bernabéu and beat the Merengues 3-2 to take home 3 vital points in La Liga's title race. 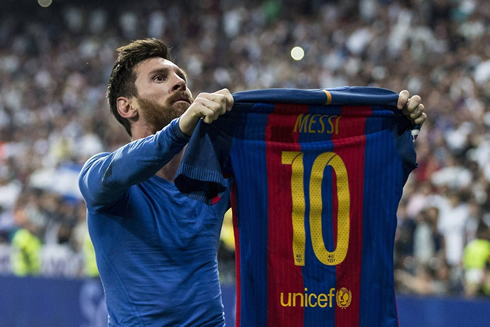 Casemiro and James scored for the hosts, but Messi had plans of his own and would score the winning goal in added time. 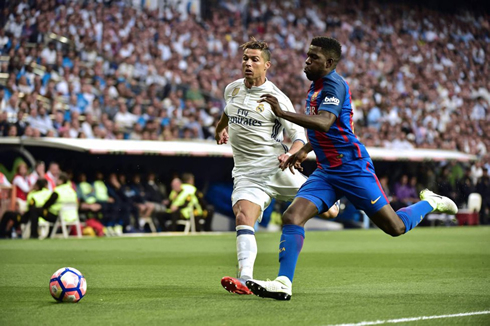 Real Madrid had a golden chance to virtually secure La Liga title tonight in "El Clasico", but Zinedine Zidane's men were surprised by a persevering Barcelona side led by Lionel Messi, who took the Bernabéu by storm in a spectacular 3-2 win. 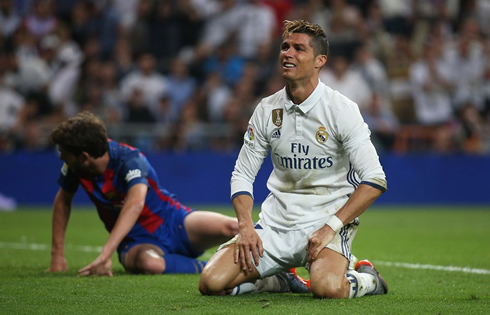 The game was full of incidents, starting with another Gareth Bale injury, or Sergio Ramos being shown another red card or Lionel Messi scoring a brace that allows Barça to stay up top on the fight for La Liga title. Cristiano Ronaldo had a few chances to score this evening, but unfortunately he ended up missing them and that turned out to be costly to his team. Casemiro and James Rodríguez scored a goal each for the Merengues, while Rakitic and Messi with a double wrote their names in the scoresheet for the visitors. The two teams are now tied on top of the Spanish league, but Real Madrid still has one game in hand. El Clasico is still, beyond any doubts, the biggest match in the world. Everything was perfectly set, Real Madrid coming off a massive victory over Bayern Munich (6-3 on aggregate) in the midweek and Barça out of the UEFA Champions League after losing to Juventus (3-0 on aggregate). 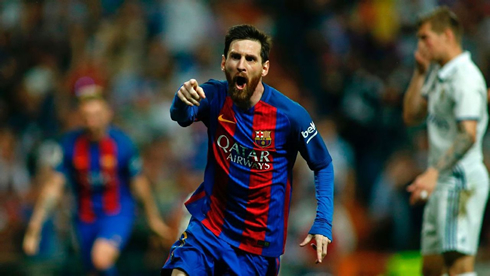 Unfortunately, Real Madrid came up second best tonight, as Lionel Messi bossed the match at the Santiago Bernabéu giving Barcelona a 3-2 victory in the dying moments. It was a frustrating result, as Real Madrid conceded the goal with the last kick of the game. It's actually unbelievable that no one was able to foul Barcelona in the last few seconds as they headed towards goal. Any foul and the match would have been over and the frustration from knowing that was well caught in gestures from players like Cristiano Ronaldo. It's an extremely disappointing game for all Madridistas and a soul crushing defeat to the biggest rivals. Going forward, Real Madrid must regroup and come back together as one if they want to secure the league. Worse yet, Real Madrid must now manage to do well with a serious lack of centerbacks on the team. Pepe and Varane are still injured and Ramos will be handed a 2-match ban in Spain. All in all, a crushing defeat. 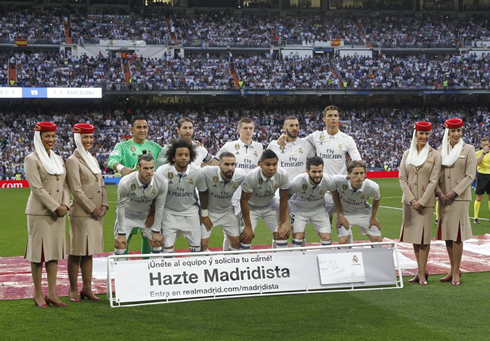 But as always, Hala Madrid! Cristiano Ronaldo next game is a La Liga fixture, on April 26 of 2017 against Deportivo de la Coruña. You can watch Juventus live stream, Deportivo vs Real Madrid, Atletico Madrid vs Villarreal, Crystal Palace vs Tottenham, Newcastle vs Preston, and Stuttgart vs Union Berlin, all matches provided from our live football game pages.